US, Philadelphia – To say that no one, in the current field of aspirants for the upcoming elections in the United States, is qualified to be president will be an understatement. That any – even any democrat – deserves the African American vote, will be sarcastic. And so is Hilary Clinton. Every African American should sit home if Hilary Clinton is the democratic presidential nominee for president. For two reasons alone. First, she is the Queen of the past and present Mass Incarceration of Black men. And Secondly, her heart hasn’t changed – or cannot change – after more than two decades of the havoc that Bill Clinton’s policies have wrecked on African American societies. Afiya X. of Grandmother detailed how Bill Clinton, with Hilary Clinton as his staunchest support, used tax payers’ money to strengthen the police forces that kill at first sight, and put a record number of Black men and women behind bars. In 1994 alone, the Bill and Hilary movement – The Billary Clintons – instituted the “three strikes and you’re out” law, which was a $30 billion crime bill that according to legal expert Michelle Alexander, created dozens of new federal capital crimes, mandated life sentences for three-time offenders, and authorized more than $16 billion for state prison grants and expansion of state and local police forces. The focus was on putting an economically advancing African American community back in shackles! What’s more, The Billary Clintons signed the Personal Responsibility and Work Opportunity Reconciliation Act that essentially imposed a ban on how long families could use government help – welfare – shortening the period to a five-year lifetime limit. With his “One Strike and You’re Out” Initiative, The Billary Clintons made it impossible for anyone who had ever been marked with a criminal record to receive any assistance from the government. In addition, anyone convicted of a felony drug offense, including people who go to jail for simple possession of marijuana, could never in their lifetime be eligible for welfare, food stamps or even vote. The Billary Clintons went above and beyond to prevent anyone, especially African Americans, with a criminal history from living in public housing no matter how poor and destitute. 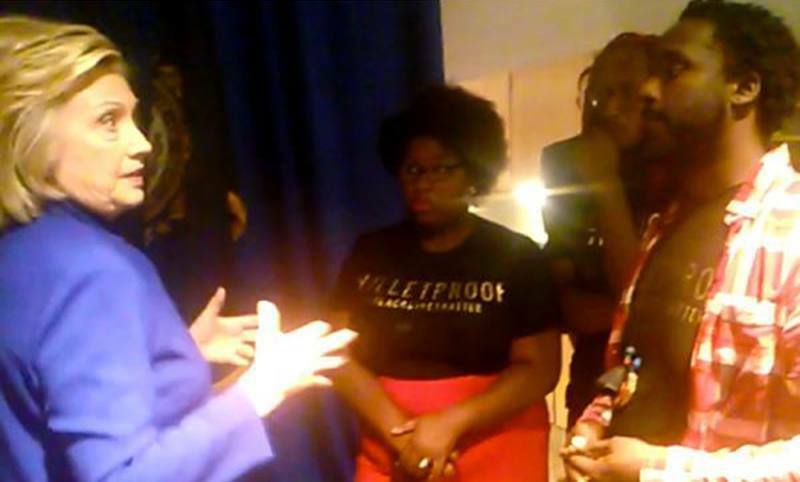 So it was in this light that Civil Rights activists from the Boston chapter of the Black Lives Matter movement planned to disrupt Clinton’s campaign event in New Hampshire last week. To ask tough questions. But they were prevented from entering and instead held a heated private meeting with the Democratic frontrunner, who has yet to unveil formal platforms apologizing for her mistakes, or for the barbarity of the Billary policies on racial justice or criminal justice reform. No African American is fooled when Ms. Clinton feigns advocacy for Civil Rights in her numerous speeches around the US begging for the African American vote. Who cares? It’s 2015, and after all these years it had to take the first and only Black president of the United States so far – Barack Obama – to take a few heavily laden steps towards a positive direction in African American civil rights. Because, African American leaders keep getting coaxed into leading their populace into voting for people like the Billary Clintons. But that must stop. It stops in 2016. Very amusing term for the Clinton Machine – Billary Clintons! I think the Clinton campaign should be branded as such. Let’s be clear, Bill and Hilary are the devils that came to African Americans in sheep’s clothing. They have been the most racist couple in all of America’s history. The millions of African American lives they have destroyed through programs everyone knew from the start was directed against Blacks. It’s outstanding the Democrats allow this machine to control their party. Hilary Clinton surely cannot lead a diverse America. She and her husband do not like Blacks very much. Look, she can’t even repent! Hilary Clinton is incapable of taking and reflecting on criticism. Even God cannot admonish this lady – all she does is flip out each time she’s confronted by past mistakes, misdeeds. She wants to run from president? African Americans should tell her to vanish! The Democratic party is a pathetic bunch. If Joe Biden does not run, well, America can expect Donald Trump to be president. It just gets worse from there with that UPenn – Wharton School kid.